This component uses the Mailchimp API to retrieve data and load it into a table. This stages the data, so the table is reloaded each time. You may then use transformations to enrich and manage the data in permanent tables. Basic/Advanced Mode Choice Basic - This mode will build a Mailchimp Query for you using settings from Data Source, Data Selection and Data Source Filter parameters. In most cases, this will be sufficient. Advanced - This mode will require you to write an SQL-like query which is translated into one or more Mailchimp API calls. The available fields and their descriptions are documented in the data model. Authentication Method Choice Select an authentication method. Mailchimp gives the opion of using OAuth or an API. Each requires a unique set of properties for the component. Authentication Select Select the set of credentials to use to connect to Mailchimp. These must be set up in advance, using Project → Manage OAuth. Data Centre Text Provide an address for the desired Mailchimp server. API Key Select This is only displayed if the Table Distribution Style is set to Key. It is the column used to determine which cluster node the row is stored on. 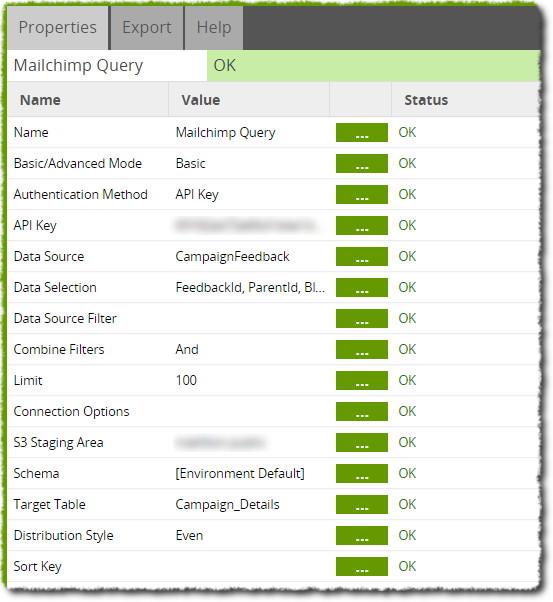 This example uses the Mailchimp Query Component to copy data from a Mailchimp server, to an S3 Bucket and then finally load the data into a table. The table itself is created by the Create/Replace Table Component and is called 'Campaign_Details'. The Mailchimp properties are set up to use an API Key as the Authentication Method. An API key taken from the Mailchimp account is entered and the Data Selection property will automatically load and display any available data connected to the account, from which we select CampaignFeedback. The Mailchimp Query Component will then put this data onto the specified S3 Bucket and from there load the data into the table specified in the Target Table property.